Last weekend Mill Valley, CA’s wonderful Throckmorton Theatre joint ventured with Telluride’s excellent MountainFilm festival to screen 9 programs of stimulating outdoors films. This was the 4th annual “MountainFilm in Mill Valley” and the most successful to date, with most programs sold out and filled to capacity. In the endeavor, Throckmorton Theatre joined the other 150 or so venues around the world that are participants in MountainFilm’s traveling program. MountainFilm’s presence was impressive with David Holbrook, MountainFilm’s Festival Director, and Henry Lystad, Touring Program Director on the scene and tag-teaming on the emceeing. I attended 5 of the programs and herein offer capsule reviews of several of the films. 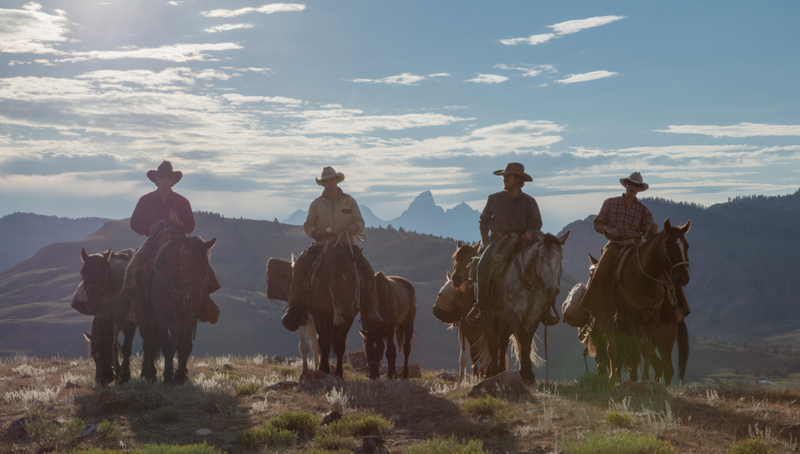 Friday evening’s feature film, Unbranded, is both an adventure story as well as an introductory, evenhanded commentary on wild horses in the U.S. West. There are now 50,000 wild horses in U.S. government holding facilities awaiting adoption along with thousands more the wild. Those in the wild compete for grassland with livestock ranchers, a background theme. The main storyline is of 4 buddies from Texas A & M who adopted, trained, and rode wild horses on a 3000 mile trail ride through the West’s always scenic terrain from Mexico to Canada. From Mexico to Canada, this appears to be in Wyoming with the Grand Teton in the background. From the program notes: “What ensues is an epic adventure of self-discovery, friendship, and gorgeous landscapes…” The film’s producer, Dennis Aig, was in attendance and provided lucid and insightful comments. Saturday’s early afternoon program featured Les Voyageurs Sans Trace, otherwise known as the French Kayak Film. This very nice film is based on the first known decent (1938) of the Green and Colorado Rivers by 3 young Parisians. Much of that trip was captured on color film, a fairly new technology. That historic footage is interspersed with footage from a more recent decent by the filmmaker, Ian McCluskey, and well selected talking heads to tell an interesting adventure/exploration story. Well filmed, well edited, and a good story make for a paragon of independent filmmaking on a modest budget. The filmmaker did insightful Q&A from his office in Portland by Skype and he’s one who I’m sure will gain additional respect and recognition from this and his future films. who know him well, footage of some his pioneering runs such as the Grand Teton, and spectacular footage of recent descents in Alaska and the Himalyas, this film kept one’s attention. A most interesting person and a very good film that is at the summit of its genre. Saturday evening’s feature was Racing Extinction, directed by Louie Psihoyous. I had high hopes for this film as I’d seen its promotional trailer in, of all places, an Orange County movie theater. And I knew its director did a film I think really highly of, The Cove, which was awarded the Academy Award for Best Documentary Feature in 2010. However, Racing Extinction disappointed me (and others). It ran through a far too extensive compendium of environmental problems without much in the way of suggested solutions. To me the film was disjointed, jumping from one problem in one location to another problem in a distant location. I believe the filmmaker was sincerely trying to inspire action, but at the end I felt adrift. What to make of all this and what to do now? Not much in the way of suggestions. Mr. Psihoyus was in attendance and joined Mr. Holbrook for a nicely done Q & A session. They were eventually joined by NASCAR race car driver (! ), Leilani Munter who, with a sleek Tesla automobile specially outfitted with complicated equipment to project large images on large buildings at night, was a rather strange appendage to the end of the film. After Q & A and upon exiting the building, patrons received a festival bonus, a closeup of the Tesla itself, which was projecting on a building across the street (until batteries ran down) along with a well informed docent. Sunday early afternoon featured Down to Nothing which told the story of a 5 person team attempting to summit an obscure Burmese peak. This film didn’t do much for me either, although it was well filmed and edited with the support of National Geographic. The storyline seemed forced and the team members had a faint air of entitlement. Contrasting their complaints about nature’s conditions and their dwindling food supply (due to their own poor trip planning) with the locals’ modest lifestyles, what I was seeing just didn’t seem right. 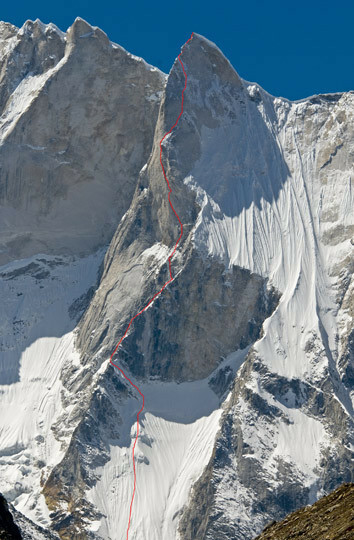 Sunday evening’s feature was Meru, named after a formidable peak in India. (I didn’t attend this screening because I’d seen the film at the Kabuki in San Francisco.) The storyline is of 3 climbers and their – obsession is as good a word as any – with summiting this most difficult, previously unclimbed peak. Route taken to Meru’s summit (!). Courtesy of Alpinist.com. They tried in 2007 but were turned back a few hundred feet short. They then individually endured some serious physical mishaps and were discouraged by their families to attempt Meru again. Undeterred, in 2011 they made another effort and, after a strong dose of mountaineers’ customary hardships and suffering, were successful at summiting and were the first ever to do so. Stunning scenery and footage, interesting and world class climbers, and the articulate and well informed Jon Krakauer providing commentary all combine to make this film well worth seeing. This entry was posted in Books & Films, Film Festivals, Outdoors, Terrestrial. Bookmark the permalink.